Marouane Fellaini had built a reputation as Jose Mourinho’s go-to option when Manchester United were chasing a late goal. Sent from the bench to create chaos inside the opposition penalty area, the giant Belgian’s aerial prowess has been an effective weapon. Over the past few weeks in the Premier League there has been a big change in how Fellaini has been used. Mourinho has opted to deploy him from the start as a defensive midfielder, with the directive to screen United’s back four. Fellaini’s brief is to keep Man Utd in a disciplined shape that allows box-to-box midfielder Paul Pogba and one of Fred or Nemanja Matic to push on either side of him. Interestingly, given his background as an attacking player, the Belgian’s approach has been very defensive. Dropping in between the two central defenders when United are on the back foot, he has acted as an auxiliary centre-back. In this role the 193cm powerhouse has cleared danger from inside his own box 18 times in his last three starts. Fellaini is a strong ball-winner. He has regained possession more times than anyone else for the Red Devils in two of the last three Premier League matches. Last weekend against Wolverhampton Wanderers the midfielder covered the most ground, too. He ran 11.53km at an impressive average speed of 7.13km/h, the third-fastest return among his team-mates. When Mark Noble, Pedro Obiang and Andriy Yarmolenko step into Fellaini’s area for West Ham United in this Saturday's early match, they will run into a player relishing his new defensive responsibilities. With Fellaini stationed in such a deep role within a midfield trio, Pogba has been released from most of his defensive duties. As a consequence, we have seen more of the Frenchman inside the final third. The 15 shots Pogba has had in the Premier League are more than any United player, including Romelu Lukaku and Fred, who have shot 12 and seven times respectively. Within the present 4-3-3 system that Mourinho prefers, a formation he used only 10 times last term, Fellaini is competing with Andreas Pereira for a starting berth. On the ball Pereira is a confident passer, but in recent outings Fellaini has matched the Brazilian's accuracy with sensible, no-frills distribution. And in defensive scenarios, Fellaini boasts a clear advantage over his 22-year-old team-mate. 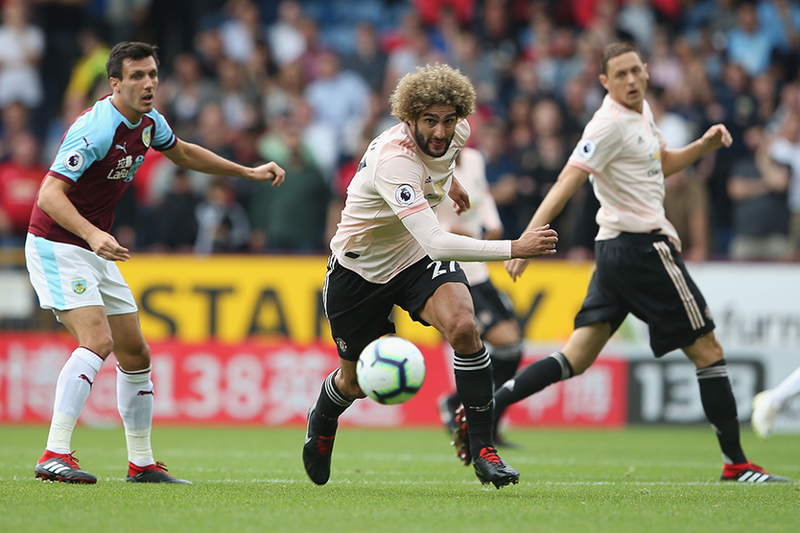 Using his physicality, Fellaini is a better ball-winner and the platform he provided for the gritty wins at Burnley and Watford will have impressed his manager. He is not the quickest distributor of the ball and can be caught out by fast opponents who pop up in between the lines but, overall, Fellaini is well equipped to do this job. The battle between the revamped midfield of West Ham and that of United, with Fellaini at its hub, will be worth keeping a close eye on this weekend.